The Spiralizer Cookbook 2.0 offers a fresh approach to the innovative tool that slices vegetables and fruits into noodles, shoestrings, thin shreds, and waferlike slices in seconds. This compact yet comprehensive guide to spiralizing includes everything you need to know, from how to assemble your spiralizer to understanding its unique blades and over 20 inspiring recipes for every meal of the day. 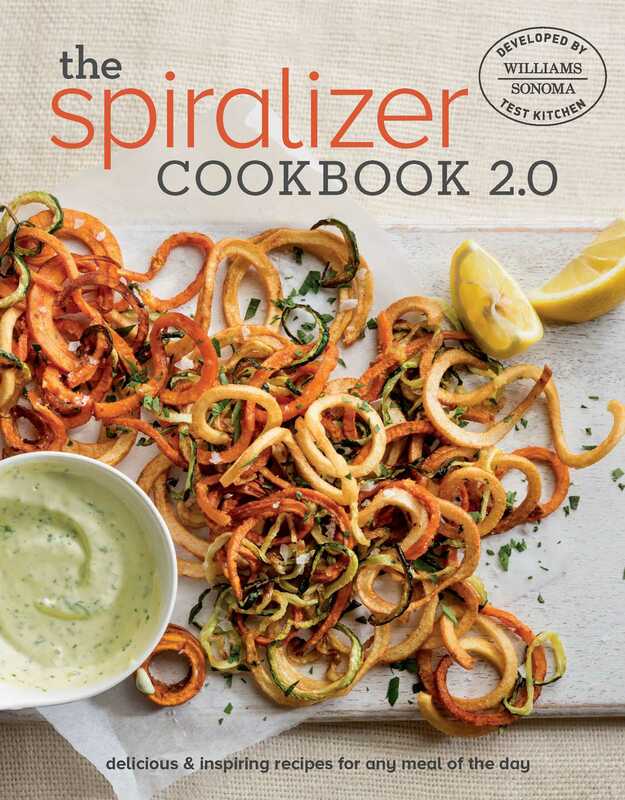 This beautifully photographed handbook provides expert tips on how to use your spiralizer to make more than 20 delicious recipes for inspiring snacks, main dishes, desserts, and more. Find easy-to-follow recipes for Apple Pancakes; Baked Eggs with Zucchini; Shrimp Spring Rolls with Peanut Sauce; Apple-Cabbage Salad with Bacon & Candied Walnuts; Chicken Pho with Daikon Radish Noodles; Fresh Parsnip Pasta Primavera; Apple Galette; Curly Fries; Cucumber Gimlet, and much more, all utilizing the spiralizer. With The Spiralizer Cookbook 2.0 you can create delicious, low carb meals, full of fresh vegetables and fruits that everyone will love. Spiralize the zucchini using the Fine Shredder Blade, stopping to cut the strands every 3–4 rotations. Spiralize the lemon using the Straight Blade. In a bowl, toss together the zucchini, tomatoes, and lemon juice and season with salt and pepper. Sprinkle both sides of each halibut fillet with a pinch of salt and a grinding of pepper. Cut 4 sheets of parchment paper, each 12 by 16 inches, and lay them on a work surface. Bring the short sides of each sheet together, fold the sheet in half, and crease, then open it flat. For each packet, spoon one-fourth of the zucchini mixture on one side of the crease and top with a halibut fillet. Place a few lemon spirals and one-fourth of the pine nuts on the fish, then drizzle lightly with oil. Bring the uncovered side of the parchment over the fish and, starting at one end of the crease, fold the edges together to create a sealed packet. Place the packets on a baking sheet. Roast until the fish is just cooked through, 10–12 minutes. Carefully open the packets, garnish with basil, and serve warm. Alternatively, allow guests to open their own packets and pass the basil at the table.